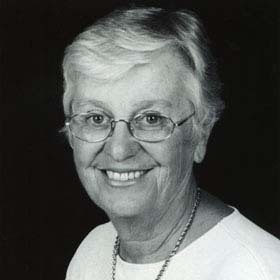 Naomi Gladish Smith, born in England to American parents, is the daughter and granddaughter of Swedenborgian ministers, and while religion has been a central part of her life and her three recent novels, The Arrivals, The Wanderers, and The Searchers, are about the afterlife, when she began writing, her work certainly hadn't anything to do with religion. Matter of fact, her first book, Buried Remembrance, was a mystery. Her essays on a variety of subjects have appeared in venues as diverse as The Christian Science Monitor, JAMA, and Chrysalis Reader anthologies and her short story, "Lamartine's Wife" is in the current issue of Soundings Review . She has read about a dozen of her essays on WBEZ, Chicago's NPR station. When writing essays and stories, Naomi often found herself describing her religious background and beliefs. From there it wasn't a far step to writing novels that may provide an answer to the question most of us ask: "What happens when we die?" Naomi now lives in Glenview, Illinois and Lake Worth, Florida. She is still fascinated by the subject of the afterlife and continues to write about it. Her novels, The Arrivals, The Wanderers, and The Searchers, can be ordered from the Swedenborg Foundation (www.Swedenborg.com), and of course from Amazon and Barnes and Noble. Look in the 'Works' section for more about The Searchers, reviewed in the January 24, 2011 Publishers Weekly and in the Mar/April issue of ForeWord Review. The novel was twice a Literary World "Religion Daily Book Pick" and also a finalist in the "USA Best Books 2011 Awards". And now! Her latest! A memoir of her father, V as in Victor, can be ordered from eLectiopublishing.com, Amazon, and Barnes and Noble. V as in Victor is the story of an American minister and his family in a small pastorate in England between the World Wars and their life in the United States during and after WWII. Victor's letters and those of his former parishioners give a vivid picture of the homefronts in both England and America. But more than that, this is the story of a man whose struggles might have destroyed him, but did not. An uplifting tale of a man's ongoing quest for the chance to serve his church and his earnest desire to live a life according to the precepts of his religion, V as in Victor will touch your heart. The novel, the third in this series about people in the afterlife, invites the reader to come with a group of 'students' on a journey that will end either in heaven - or what we would call hell, but they will call home. The Wanderers visits a world beyond this one, where a group of travelers discover that the decisions made while on earth have more consequences than they could ever have imagined. Dramatizes the afterlife in a way that will have the reader thinking about it for a long time after finishing the story. "Sobering, provocative and thoroughly entertaining." The writer muses on the death of her elderly parents.